Chris Lessway of Fuller’s North Branch Outing Club with an Au Sable river brown trout. “Dialed in.” In fly fishing, it’s a form of self-actualization, a state of grace and harmony with the cosmos that separates those who merely fish a given body of water from those who are part and parcel of it. Being dialed in means you can look at a river on a given day in a given year and know what you want to do and why. You get there by putting in the time, of course, but that’s not all of it—you’ve got to put in the right kind of time. This year try putting into practice some of the ideas below, and get to know your river better. Before I elaborate I’m going to pause for a moment and give presentation purists a chance to leave the room. You can all return in one paragraph. A lot of the most dialed-in folks I’ve ever fished with are omnivores—they throw streamers, swing flies, fish indicators, chug topwaters, and tight-line nymph. Some even throw gear on rare occasion. In short, they aren’t necessarily concerned with propriety—they’re too busy getting dialed in for that. But what is it about omnivorousness of presentation that correlates with being dialed in? Is it simply the fact that you’re probably catching more fish? I’m not so sure. My own take is that different presentation methods give you different data on the water. Your flies and fly lines are a kind of sonar for structure, cover and current. Czech nymphing will help you find spots-on-spots and snags-on-snags that you might not otherwise have found. Swinging flies is going to let you cover a bunch of water and help you discover lies you might not otherwise have known about. Dead-drifting flies with a floating line reveals current behavior and speeds up your understanding of seams and eddies. Thinking of presentation not only as something that gets you fish but also gets you data on the water brings us to our next point. This isn’t because longer casts catch more fish. But longer casts and drifts mean your personal sonar has longer reach. If you cast, say, 400 times in a day, and all of a sudden each of those casts is ten feet longer than it was last year, then it stands to reason that you’ve added 4,000 more feet to your known water. If you’re a wading angler, pick up a spey or switch rod and learn to use it. On a small to mid-sized river a switch rod in competent casting hands will allow you to swing through just about every square foot of water. How many times have you wondered if a fish would eat a skated fly? How many times have you actually tried it? Next time you’re on a float or long wade session, keep an eye out for those spots on a river that other people just can’t fish, and figure out a strategy for fishing them. One of the best pieces of advice given to me was by Jeff Hubbard of the Pere Marquette as he shared one of his favorite swing slots—favorite because 1) it could only be fished on the swing on a river where 95% of the folks fish some form of nymph rig, and 2) even for swingers you needed a highly specialized tip, fly, cast and mend to get into the zone. I did as I was told and hooked up with a mean buck that promptly ran me off into a log jam. Even though it was a busy day on that river, we were pretty sure that this was the first presentation that fish had seen since the last time Jeff had fished it. The importance of angle retrieve for muskies in particular was impressed on me just this past summer. We had worked a bend pool hard—as in 30 casts hard—and just as we were leaving one of our party made one last cast to that heavily pounded water. After bombing it out directly upstream and retrieving straight back with the current, he got followed by a fish that literally sat beneath the boat watching the figure 8 for close to a minute. We went upstream to rest the fish for an hour, then came back and did the same thing: pounded the water from conventional angles. Nothing. Only when we slipped the boat down a dozen yards and brought the fly back through the zone in a straight downstream direction did that same fish follow. The take-away: once you’ve established prime fish-holding places, dial them in even more by approaching them from a variety of angles. Sometimes it’s one angle in particular that unlocks the door. At some point your water is going to get low and clear, and it’s at that time that I encourage you to hit your river with a paddleboard. Rent one, borrow one, buy one, whatever—it’s the closest you’ll ever get to being a drone. No matter how well you think you know your river, I assure you that standing six feet above the water for the direction of your float will give a a fresh perspective and a better understanding of your water. Each time I take out the board, I’m surprised at how my knowledge gets not only expanded but in places very much corrected. Some holes are deeper than you thought, some holes are shallower, and some logjams have ambush points in places other than where you’ve been hitting them. Most people who keep fishing logs might write down the date, time, water temperature, and air temperature, but that only tells a very part of the story. Capturing the fact that it’s 82 degrees on June 6th when you see the season’s first brown drakes doesn’t mean that 82 degrees on June 6th the following year is going to mean squat. It’s all about what came before it, the season in context, that mix of photo-period, temperature, and rain events that together comprise the season. And do you know what keeps a pretty good log of all those things? Plants. On a river I grew up fishing, you could always tell when the white bass would enter the river by the time the dogwoods would blossom. And over the years I’ve discovered that a local strawberry patch tends to predict pretty accurately the start of the hex season. I drive past the field, and once I start to see bright red, I know it’s time to get to the water. What about your home water? What’s happening in the surrounding environment when the fish really turn on for the season? What’s happening when, later in the year, they turn off? If a gear angler invites you fishing, don’t decline just because they fish differently than you. I have a number of friends and family who only fish gear, which makes fishing together a two-way learning experience. Sometimes they learn from me. Once, during late-season musky fishing, I had moved five fish to my friend’s zero, catching three of them. We discovered it wasn’t necessarily size that was important, it was speed, and he didn’t have anything in his box that sank slowly enough to jimmy the lock on a fish. We ended up pinching a necklace of lead above one of my muskies flies, making it just heavy enough for him to handle on his bait caster. He shortly thereafter moved his first musky of the trip. Another time I was fishing with friend on a day that smallmouth were in a total funk. After two hours of nothing, my partner started picking up fishing by barely crawling a tube jig along the bottom. I tied on a crayfish imitation, put on a sink tip and swung it oh so slowly along the bottom in something between a swing and a dead drift, and caught the biggest smallmouth of my life. To this day, the crayfish swing/drift is a tactic I turn to when smallmouth have lockjaw. You don’t need to buy your marabou by the pound, but if you want to dial in your local water, you should take up a regular practice of fly tying. Tying your own flies creates a mutual feedback loop between your brain and the river. You’ll take info from the river to the vise, and you’ll take ideas from the vise to the river. It’ll make you pay the right kind of attention to your presentation, what it’s doing and what you want it to do. 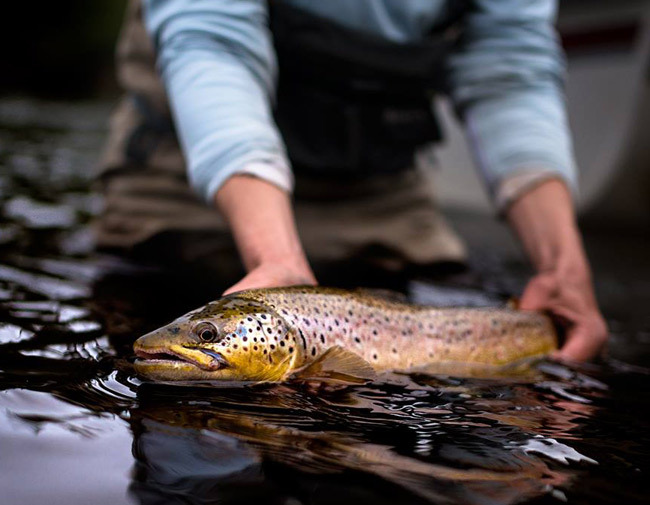 The most effective swing anglers know what they can do with a given flow rate—not only where the fish are, but what spots in the river they can present to. Here’s the hole you can’t swing through at low cfs (cubic feet per second, a common measure of river water speed and volume), because you’ll never avoid the wood. Here’s the run you need to avoid at high cfs, because it’s just impossible to find the bucket. Water levels aren’t just something to pay attention to relative to yesterday’s or last week’s flows. You should also take a more macro-level perspective. On one smallmouth river I fish, I know that higher-than-normal water levels throughout the course of the season means fish will hang out in their spawning tributaries all summer long, making the downriver stretches a wasteland. But on low water years, the opposite is true: bass finish spawning and make a bee-line for downriver structure. On my river, it’s a question of 30 river miles, and an hour’s drive. No small shift. There are times when we get out to fish because we want to be alone. And that’s fine and good. But know that you’re going to shorten the learning curve when you take the time to meaningfully talk to the people you run into on the river. Carry a few extra flies in your box and offer one up to that angler who looks like they know what they’re doing. In addition to learning something new about a river, you might have a shuttle partner, or someone to go hexing or mousing with. There is such a thing as karma.